What can you do in four seconds? Busta Rhymes can rap an entire song in that time, Mick Barr of Orthrelm can play 96 notes on his guitar, my friend Prateek can chug a whole mug of beer (yes, it's a superpower) and I can eat a whole doughnut in roughly that time. 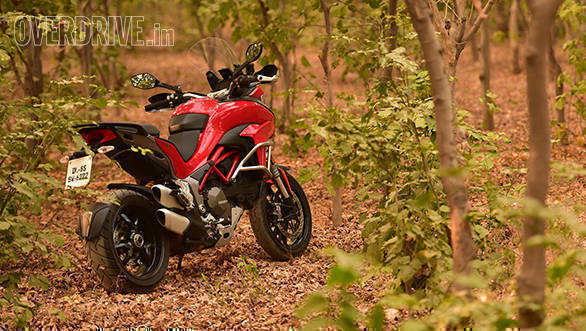 But in less than four seconds, the Ducati Multistrada 1200 S can hit 100kmph. That, in a nutshell, is what the 1200 S is all about - a tall, heavy ADV motorcycle that can leave sportsbikes feeling inadequate. The Panigale is an incredibly good-looking motorcycle. I haven't met anyone who disagrees. Why am I talking about the Panigale? Because the front-end on the Multistrada, especially those headlights, draw inspiration from the Panigale. But that's where the similarities end. Just under those beautiful headlights are two massive air intakes that look like flared nostrils. Both together make for a face that is unmistakable and quite intimidating when seen in the rear-view mirror. Ever pissed a sparrow off so much that it wanted to kill you? 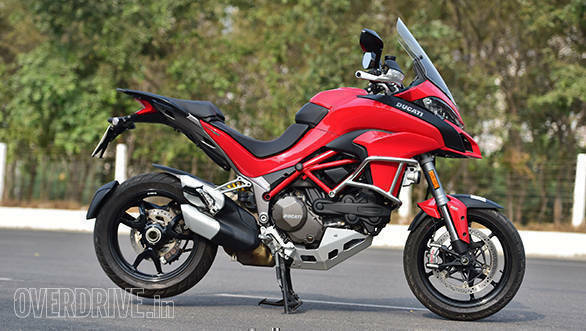 Well, if you did, then the Multistrada is what it would look like! 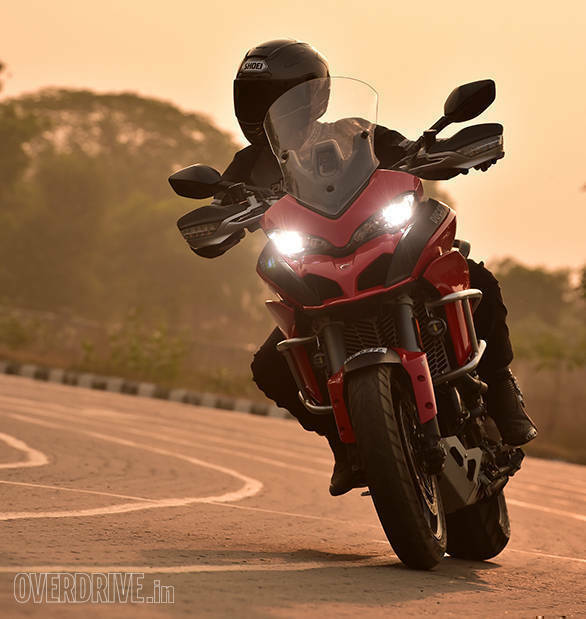 Despite being a tall motorcycle, the Multistrada is remarkably easy to manoeuvre. At its lowest seat height of 825mm, I could get both my feet on the ground thanks to the narrow seat. For a large motorcycle, the 1200 S gives you enormous confidence once you're aboard. In fact, it takes you all of five minutes to get comfortable with it once you get going. And once you get moving, the 235kg kerb weight too disappears altogether and you begin to appreciate all the other wonderful bits and pieces on this Ducati. The seat, for example, aside from being adjustable for height, is also spacious and firm enough to be comfortable over long distances. The seating position is well thought of and won't be cramped for larger riders while remaining fully accessible for the vertically challenged. 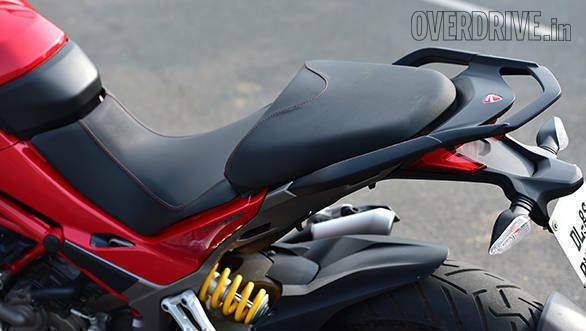 The rear seat too is wide and won't have your pillion crying foul. Our test motorcycle came with the Enduro Pack installed. This meant it got crash protection from Touratech, off-road pegs, an off-road spec bash plate, fog lamps, larger kickstand and a radiator shield. While this pack makes it a tad more trail worthy, if you're serious about riding off-road, you're better off buying a Multistrada Enduro. That said, the 1200 S does come with a whole bunch of kit that could make the space shuttle seem archaic. A full-colour TFT instrument cluster, cornering ABS, Ducati traction control, cruise control, Ducati multimedia system, full LED lights with cornering headlights, hands-free ignition, wheelie control and four riding modes, to name a few. It also gets a USB charging point under the rear seat. Fit and finish, as usual, is top-notch. In fact, unlike a lot of other Ducatis, the 1200 S takes finish levels a step further with cleaner build. Especially with the plumbing that has all been tucked away under the panels. Let me just go ahead and say this - the 1200 S handles so incredibly well! The supersport character that the engine has also applies to the chassis to a great extent. It is a joy to ride this motorcycle hard. The only thing that Ducati retained from the old Multistrada when they made the new one was the trellis frame. Everything else is new. To quote the spec sheet, the MTS1200S (as Ducati calls it) uses a 48mm, fully adjustable, upside-down Sachs fork up front and a progressive, fully adjustable Sachs monoshock at the rear. Both of them are connected to Ducati Skyhook Suspension (DSS) which electronically adjusts damping according to road conditions and the riding mode selected. It also gets Brembo's WSBK-spec M50 monobloc callipers up front that are tied in to Bosch's cornering ABS. The IMU-aided ABS measures yaw and pitch as well as the change in each of these to supply optimum braking in corners. 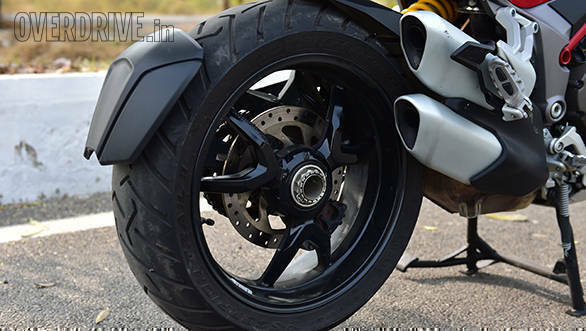 At either end of the MTS1200S is a 17-inch wheel with Pirelli Scorpion Trail II rubber. What does all this add up to? The Multistrada is effortless to corner. It changes direction with speed and accuracy. And for such a tall bike, left to right transition is second nature and happens without hesitation or indecision. Once you get going, it takes hardly any time to get used to the bike, and before you know it, you will be throwing the bike around and slicing through traffic. The cornering ABS aids you a lot in this sort of shenanigans. You can commit fully into a corner and then grab a fist full of brake. You brain tells you at this point that you have a death wish, but the cornering ABS calms everything down and makes sure that you keep going in the exact direction that you want to. And the amount of ridiculousness you intend to be up to can be further fine-tuned by choosing one of the four riding modes. 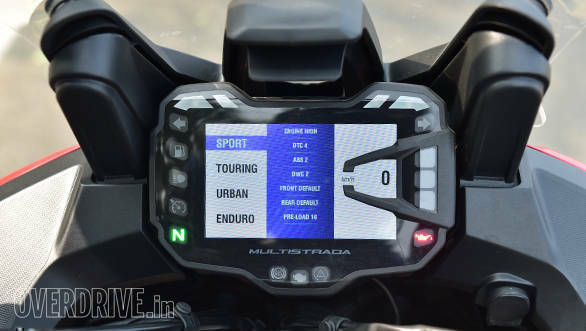 The DSS is connected to the riding modes and can also be adjusted within the four modes - Sport, Touring, Urban and Enduro. Within each of the modes, damping can be set to whatever you prefer. The stock setting, of course, is medium. But between the modes, the medium also varies. For example, the medium damping in Sport mode will be stiffer than that in Touring. Between the modes, Sport is the most cornering friendly. In all the other modes, the motorcycle weaves a bit. On the flip side, Sport mode does make the suspension quite stiff. And if you're on Indian roads, Touring and Urban modes are the best. The suspension in these modes soaks up all the bumps and potholes, and the chassis itself seems a lot more at peace and isn't itching for action like in Sport. Enduro mode disconnects rear ABS so choose this only if you're out on unpaved roads or are very sure of what you're doing. I know this is what you have been waiting for ever since you started reading this test. Well, it was worth the wait - I guarantee it. 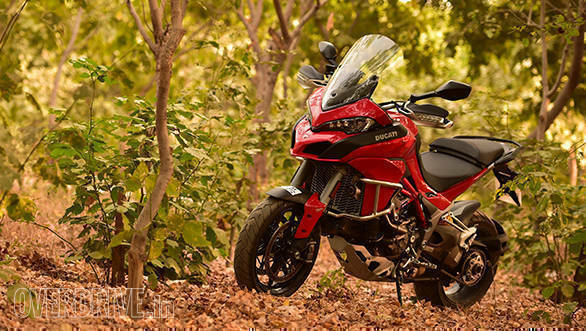 The Multistrada uses the Testastretta DVT  their 1,198.4cc L-twin that makes 160PS and 136Nm of torque. The engine incorporates Ducati's variable valve timing tech on both the exhaust and intake sides. The system allows for 90 degrees of valve overlap. This translates to an engine that is tractable both at low and high revs. It also makes the engine incredibly smooth. For a V-twin that is. Gone are the low-rev problems that used to plague the Testastrettas of the past. This new motor sets benchmarks with its usability. The motor is fed fuel though 56mm throttle bodies in the Bosch EFI system that is connected to the throttle by ride-by-wire. The presence of RbW lets the MTS1200S get one of the most sophisticated traction-control units ever. The maximum power and throttle maps vary according to the riding mode selected. Sport mode gives you full 160PS with the most aggressive throttle map while setting traction and wheelie control at low. Touring backs off the throttle sensitivity but delivers full power with traction and wheelie controls at a more intrusive setting. Urban cuts power to 100PS and also leaves you with a gentle throttle while setting traction and wheelie control at high. Enduro mode restricts power to 100PS and disconnects rear ABS while allowing more suspension travel and overall softer damping. The motor makes upwards of 100Nm from as low as 3,500rpm. This lets you chug along in high gears at ridiculously low speeds for as long as you want. It also lets you stay in that same gear and open the throttle wide to accelerate away without the engine protesting or threatening to spew its guts out. It is an incredibly easy to use engine and makes light work of traffic. But the real beauty of the engine lies in the way it performs when you are going flat out. Launch it off the line and it will hit 100kmph in 3.62 seconds. All the while the front end of the bike is threatening to lift off and you can feel the DWC reining it in. Same with the DTC and the rear wheel that is always at the brink of traction. If you can keep the throttle pinned, the 1200 S will also go on to hit 200kmph in roughly 12 seconds. Now that is serious performance. And what makes it truly spectacular is that you're doing all this while sitting upright in a comfortable seat shielded from windblast by that massive windshield. And even when the speedo is hovering around 200kmph, the bike doesn't feel stressed or maxed out. It feels like it is the most natural thing in the world. Heck, you could be whistling to yourself inside your helmet all the while. Despite all this performance, the MTS1200S isn't a fuel guzzler. It returns 17.2kmpl in the city and 22.4kmpl out on the highway. This translates to an overall efficiency of 18.5kmpl. And if you're planning on crossing countries, that translates to almost 450km of highway range.